OMG you guys! You are in for a treat. 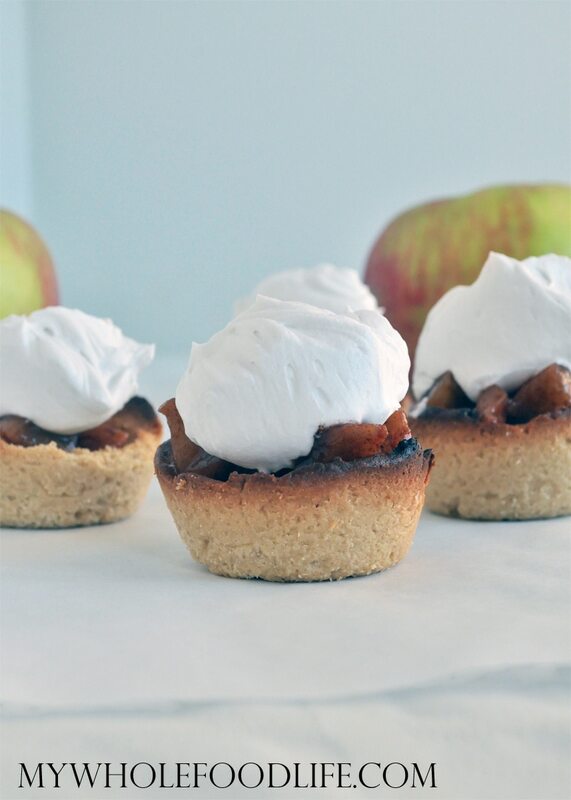 These Mini Apple Pies are epic and perfect for Fall. They best part is they are completely free of refined sugars, grains and flours! The base I used is the same one in my Lemon Coconut Cookie Cups. It worked perfectly. I love that these are perfectly bite sized for portion control. These Mini Apple Pies are vegan, gluten free and paleo. They are also so delicious. Apple desserts are my favorite, so I will be making these again soon. If you like apple recipes as well, you may want to try my crock pot applesauce or my flourless apple muffins. If you are a visual person, I filmed a video on how to make the cream topping. The perfect little bite size apple pie. If the mixture looks too runny, you can put it in the fridge for 5 minutes. Press the dough into greased muffin cups . While that is baking, make the apple mixture. Place all the filling ingredients in a saucepan . Cook covered of medium heat, stopping to stir every few minutes. Once the apples look like the have softened and cook down, remove from heat and set aside. Once the crust is done, place the pan in the fridge to cool it quick. Once cooled, carefully remove each cup from the muffin pan. Place the filling into each cup and set aside to make the whip cream. To make the whip cream, scoop out the fatty part of the coconut milk and place it in a mixing bowl with the maple syrup. Save the remaining water to add to smoothies. Using the whipping attachment on your mixer , whip into a cream. Add the cream to each top of the apple pies. These are best eaten right away, but I do think you can freeze the cup and filling part. The whip cream should always be made right before serving for best results. Enjoy! These look yummy. So the crust is just cashew butter and maple syrup, as written? Thanks! Yes it is. I know it sounds weird, but it worked. Oh! this looks so great, tastes so sweet and smell so good. Thank you for sharing. These are super cute and are a perfect little afternoon snack or dessert! Plus I love that the crust is grainless! I'm so excited to try a whipped topping for my son, who is allergic to dairy! I noticed in the video you added vanilla, but I don't see it in the recipe. Do you recommend one tablespoon of vanilla? You can either add it or leave it out. If you are adding extract, I suggest 1/2 teaspoon. If you are adding vanilla beans, you can add 1 teaspoon. Have you tried it with almond butter per chance? If so, did it work? Thanks! Sounds so good-but I'm allergic to tree nuts. Would Peanut butter work for the crust??? Maybe, but it may change the flavor. This is a lovely recipe, and I'll definitely try it. But the pies in your pic ate burnt? Odd because burnt food is terribly carcinogenic. No. It just looks like that in the pic. Why did you make them into mini pies? I mean- they look so yummy the mini size is just not going to be big enough!! !